Making the World a better place with Art! Today in the newspaper SUR in English there was an article by Tony Bryant about our association. A group of creative British expats have joined forces to raise funds for cancer research and palliative care. Known as the Lucky Quilters, the group is made up of several specialists in the traditional art of patchwork. Based in Benalmádena, Lucky Quilters is a nonprofit making culture and charity organisation. Its mission is to create a mutual understanding of people through art, offering a platform for people of different cultural backgrounds to learn the art of quilting while raising money for charity. The group supports several charitable organisations, including the Cudeca Hospice in Benalmádena. It also makes patchwork cushions for the Kölner Herzkissen e.V. Association in Köln, Germany. The colourful heart-shaped cushions help in the rehabilitation of women who have undergone surgery to remove breast cancer. The organisation was formed by Oksana Mader, a former ballet teacher who lives in Benalmádena Costa. Born in the Ukraine, and after living in Stuttgart, where she met her husband, Oksana came to live on the Costa del Sol in 2000. She began quilting just five years ago, while recuperating from a serious car accident that left her immobile and housebound for six months. 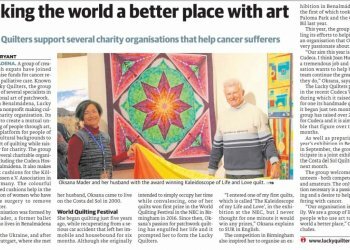 Although she originally intended to simply occupy her time while convalescing, one of her quilts won first prize in the World Quilting Festival in the NEC in Birmingham in 2016. Since then, Oksana's passion for patchwork quilting has engulfed her life and it prompted her to form the Lucky Quilters. 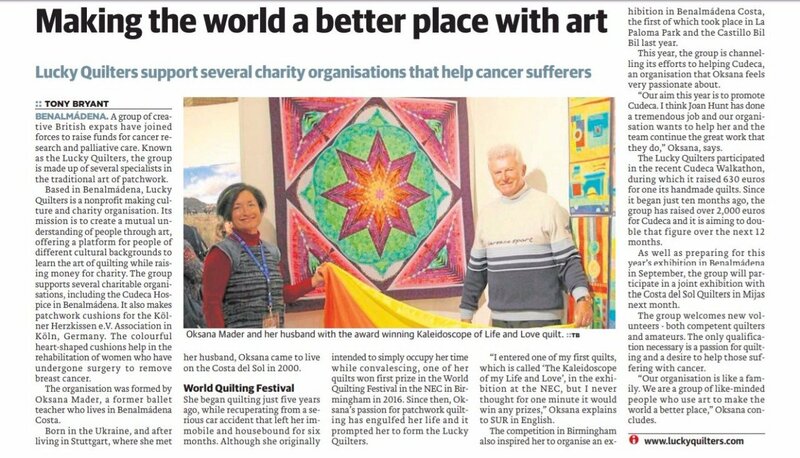 “I entered one of my first quilts, which is called 'The Kaleidoscope of my Life and Love', in the exhibition at the NEC, but I never thought for one minute it would win any prizes,” Oksana explains to SUR in English. The competition in Birmingham also inspired her to organise an exhibition in Benalmádena Costa, the first of which took place in La Paloma Park and the Castillo Bil Bil last year. This year, the group is channelling its efforts to helping Cudeca, an organisation that Oksana feels very passionate about. “Our aim this year is to promote Cudeca. I think Joan Hunt has done a tremendous job and our organisation wants to help her and the team continue the great work that they do,” Oksana, says. The Lucky Quilters participated in the recent Cudeca Walkathon, during which it raised 630 euros for one its handmade quilts. Since it began just ten months ago, the group has raised over 2,000 euros for Cudeca and it is aiming to double that figure over the next 12 months. As well as preparing for this year's exhibition in Benalmádena in September, the group will participate in a joint exhibition with the Costa del Sol Quilters in Mijas next month. The group welcomes new volunteers - both competent quilters and amateurs. The only qualification necessary is a passion for quilting and a desire to help those suffering with cancer.